The bedroom is the place in individual’s house where they use to relax after the day activities. In fact, people spend their most of time in the boudoir. Hence, this is crucial to décor it so that one can feel more comfortable and relaxed when they enter the room. Using wall tiles for the boudoir is a modern as well as the cost-effective way of decorating the room. 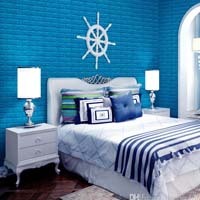 MyTyles understand the need for people and offer a wide range of bedroom wall tiles for individuals. You can get all the elegant wall tiles at a pocket-friendly price.